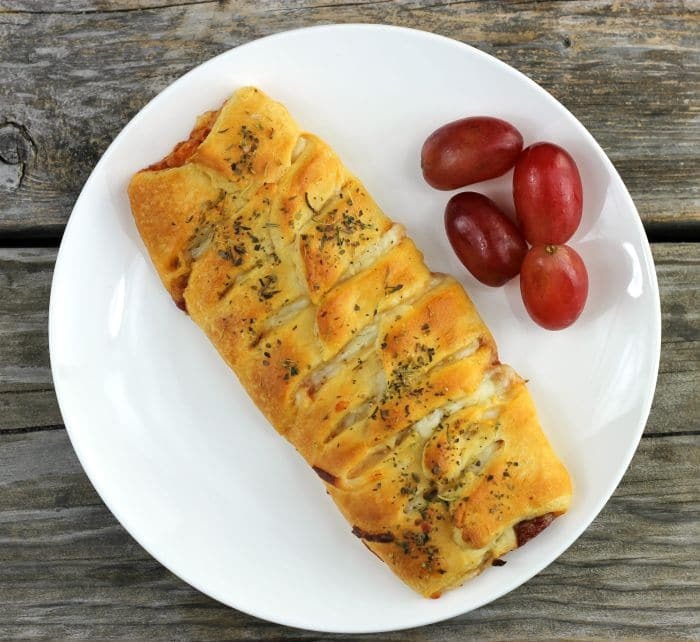 These crescent roll pizza braids are fun and easy to make. In fact, it is a recipe that you can get your kids involved with. I am sure they would love to help with adding the filling to each braid. Normally I like making my own dough when I am making pizza. I have been using the same pizza dough recipe for more than 20 years (that sounds like an awfully long time). 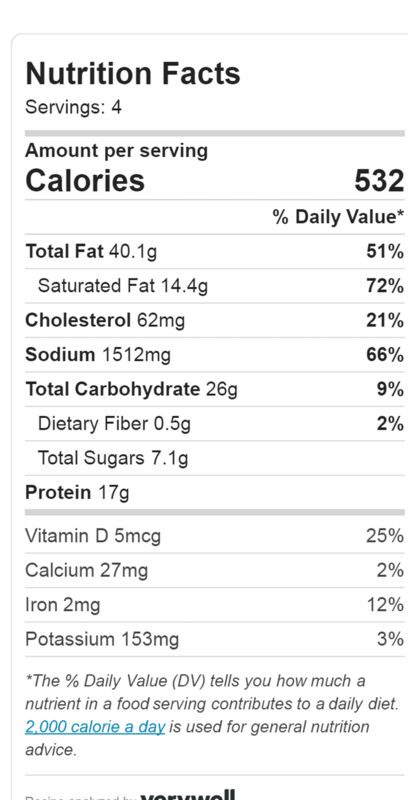 It’s a recipe that I found in a magazine way back when; I have changed it a bit to suit my taste, but it’s a good one. The crescent rolls work well for these braids and they look pretty impressive when they are baked. I like making individual braids instead of one big one that way you can change up the filling for each individual. And, that is the nice thing about making individual pizza braids each person can have what they want. Divide the dough into 4 rectangles. Seal the perforations before adding any of the ingredients. With a pizza cutter cut the sides into about 1/2 inch strips about 1 inch long. Spread the center of the dough with pizza sauce. 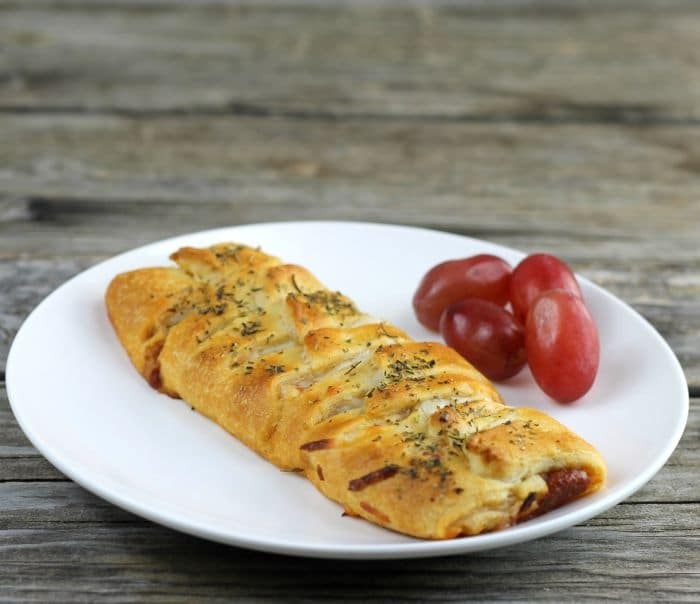 Top with pepperoni and mozzarella cheese. Starting at the end fold over one strip of dough and then take one from the opposite side and fold over the top of the first one. Continue this procedure until completed. brush with olive oil and sprinkle with Italian seasoning. Bake in a 375 degree F preheated oven for12 to 14 minutes. Divide the crescent rolls into 4 rectangles onto a sheet of parchment paper. Press the perforated seams together. With a pizza cutter cut 1/2 inch strips about a 1 inch long on each side of the rectangle. Spread about 2 tablespoons of pizza sauce down the middle of the rectangle. Top the pizza sauce with 10 slices of pepperoni then top with the mozzarella cheese. Brush the braids with olive oil and sprinkle with Italian seasoning. Place the parchment paper with the braids on a baking sheet and place in the preheated oven. Bake for 12 to 14 minutes or until the cheese is melted and the braids are golden brown. What a great idea! The braided pizza looks mouthwatering, Dawn. Have a great week Dawn! I’m up for anything and everything pizza-related. Love the idea of this bread — SO EASY to make! Wonderful idea — thanks. As a pizza lover, I love this idea. Bummer though, we don’t have canned crescent rolls or canned biscuits either. 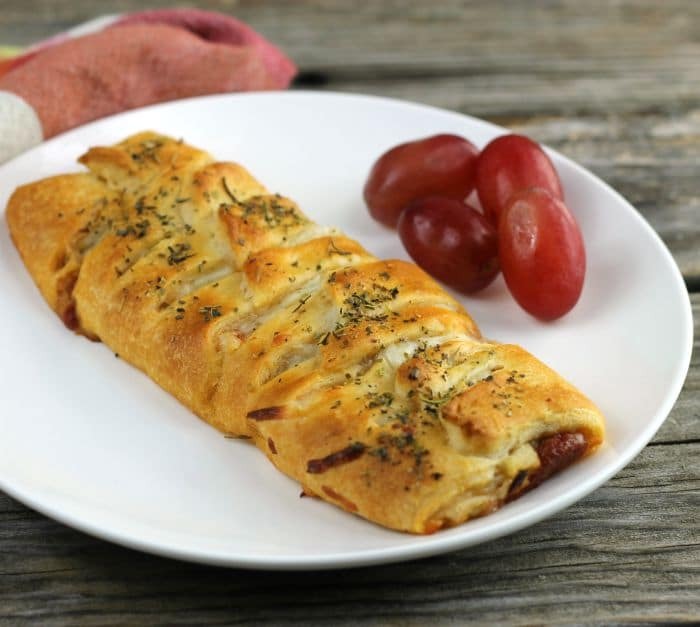 But, we do have puff pastry and I’m going make Crescent Roll Pizza Braid with that. What a fun idea! I love putting a twist on classic recipes, and this sounds like a great way to mix up pizza nights. 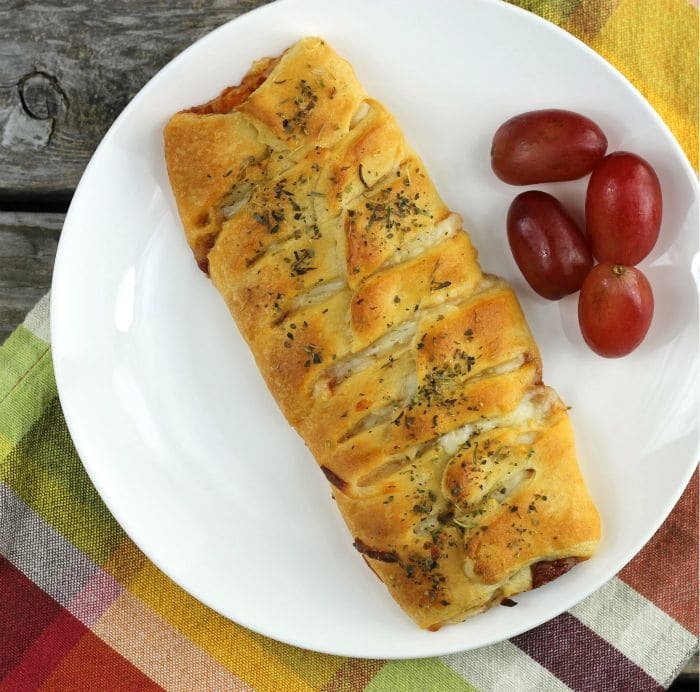 The crescent roll tip is a good one for when you’re in a hurry, but I wonder if I can make this with traditional pizza dough, too? I might have to give it a shot! Looks delicious!